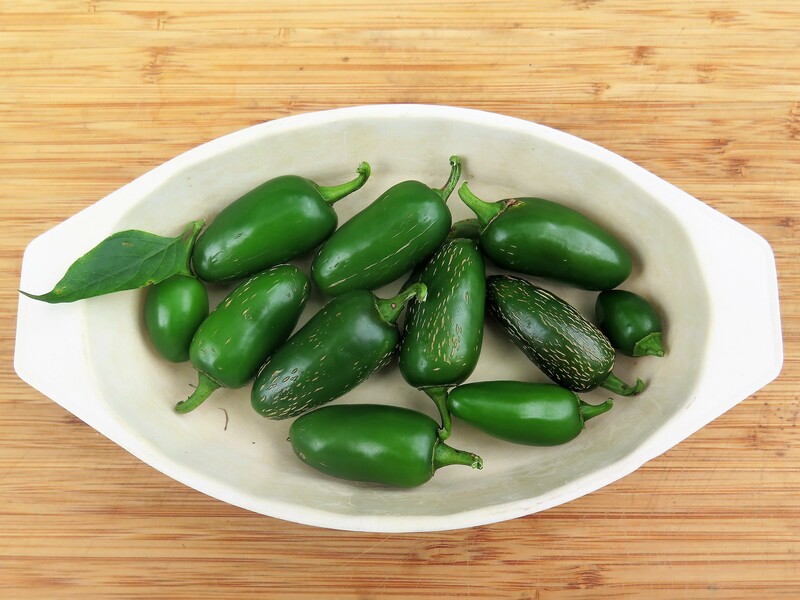 I love to sprinkle canned pickled jalapeno peppers on dishes such as nachos, tacos and omelets. A favorite family supper when my kids were young was “easy cook” super beef tacos. It was a “make it yourself” adventure. 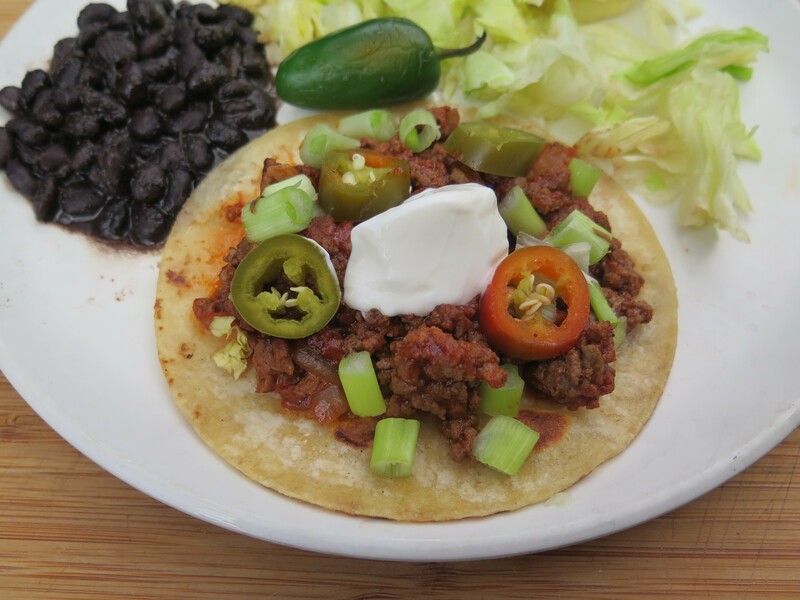 Pile on an assortment of toppings to make your own taco. Hot pickled jalapeno peppers along with corn tortillas always made the dish for me. Jalapeno peppers grew prolifically in my garden this summer. I just picked the last of the peppers and we’re already in October. Some of the peppers are starting to turn red as they ripen further. It is time to find ways to use them — so I’ll preserve some by canning them. 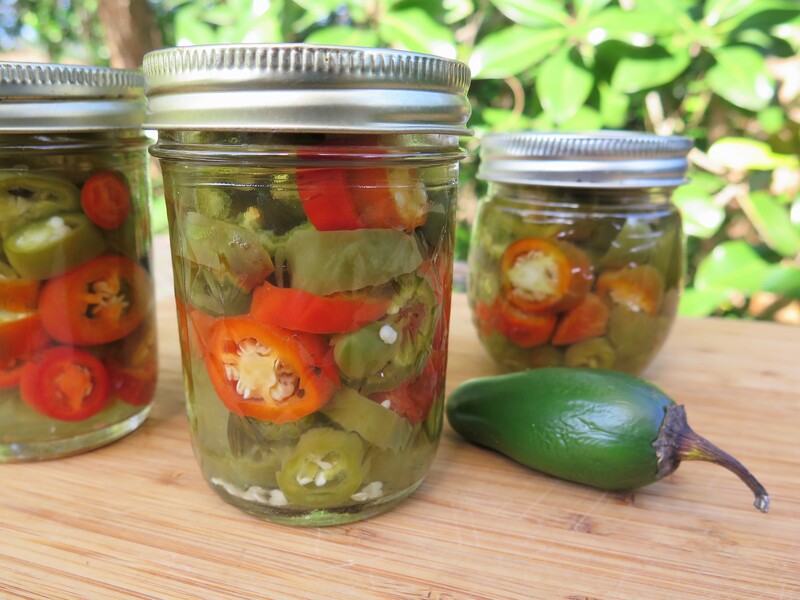 Making these pickled peppers is very simple and it is rewarding to preserve your own food. “Back to the earth.” Plus, often home canned food products have a much different and better taste than commercially canned ones. It’s a skill that has been largely forgotten but perhaps we should still keep in mind how to do this. To preserve your own peppers, wash and rinse the peppers and cut out any blemished areas. Slice the peppers crosswise discarding the stem and seeds attached to the stem. Bring the pickling brine to a boil on the stove, add the peppers and garlic cloves. Turn off the stove, let the peppers set in the brine for 10 minutes. Then transfer the peppers to sterilized canning jars packing the jars full of peppers. Add the hot pickling brine, filling to 1/2 inch of the top of the jar. Place on the seal and ring and tighten comfortably. Store in your refrigerator up to several months. To store the peppers at room temperature you must process the jars in a water bath with a canner for 5 minutes to seal the jars. 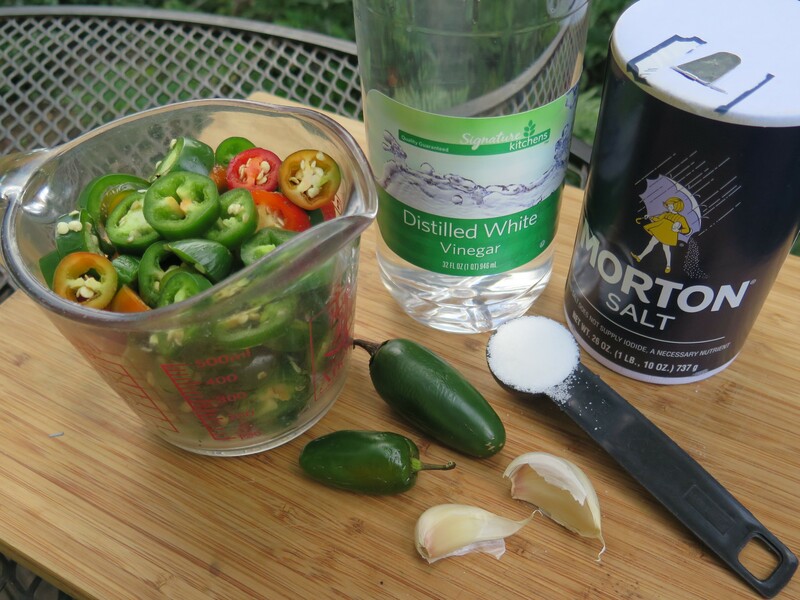 I showed how to can pickled okra in a post several years ago and the process is the same as for these jalapenos. The pickling brine consists of distilled white vinegar, water, salt and sugar. Bring to boil and then add the sliced peppers. I wouldn’t use cider vinegar or unprocessed vinegar for the pickling brine because of the risk of adding harmful organisms. It also discolors the brine. 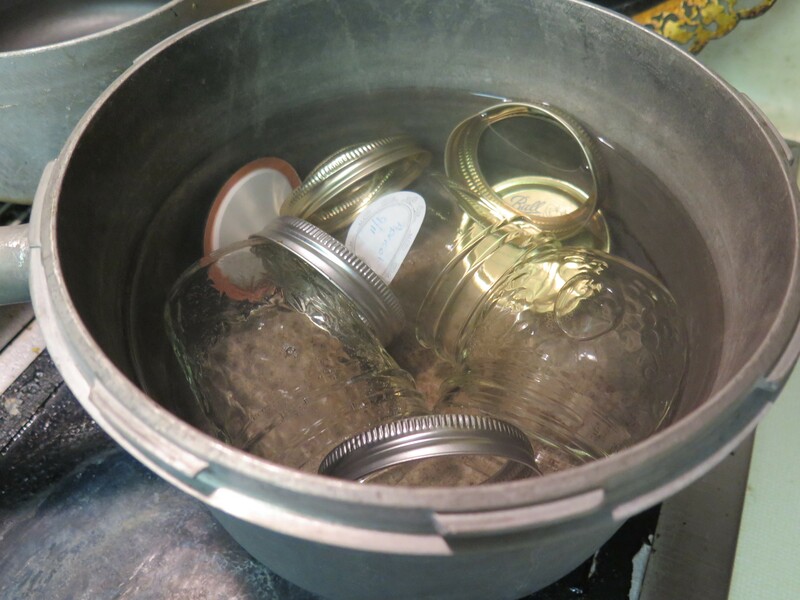 And I always use new seals (lids) that will make a tight seal and I sterilize the canning jars, lids and rings by boiling them in water for five minutes. This is a small batch of peppers so any pot large enough to accommodate the jars is fine. I wouldn’t skip this step — it’s not worth the chance of getting food poisoning due to taking short cuts. So here are my 3 jars of peppers. They turned out colorful, crunchy and had a great pickled taste. The larger jars are 1/2 pint jars (8 oz or one cup) and the small jar is a 4 oz jar. Just enough for about 2-1/2 cup sliced jalapenos. I’m looking forward to cooking some tacos for supper to use these peppers. My mother grew up on an Iowa farm and she had a large summer garden for as long as I can remember. Canning and freezing all the vegetables and fruit possible was an important part of her life. I guess that lifestyle is past. But it is still rewarding to preserve your own foods on a small scale. This recipe is quite achievable for novice cooks. Rinse and sort the jalapeno peppers removing any blemishes. Slice crosswise in thin cuts, removing stem and seeds attached to stem. Set aside. Bring distilled white vinegar, water, salt and sugar to a boil on the stove in medium sized pot. Add the sliced jalapeno peppers and garlic cloves. Turn heat off and let set for 10 minutes. Meanwhile, sterilize the canning jars, seals and rings. Place them in a large heavy pot with enough water to cover them. Bring to a boil and boil for 5 minutes. Turn off. Carefully remove the jars from water using tongs and drain. With a slotted spoon, remove the peppers from the brine (reserving the brine) and fill the hot jars to within 1/2 inch of the top, packing the jars full. Add a garlic clove to each jar. Carefully add pickling brine to the jars (use a glass measuring cup or a canning funnel) to fill within 1/2 inch of the top. Wipe off any spills around the top with a cloth. Add the seal and ring and tighten. Either store in refrigerator, up to several months, or process in a canner for 5 minutes to seal rings, if storing at room temperature. This entry was posted in Cooking Techniques, Recipes, Will It grow in Louisiana? 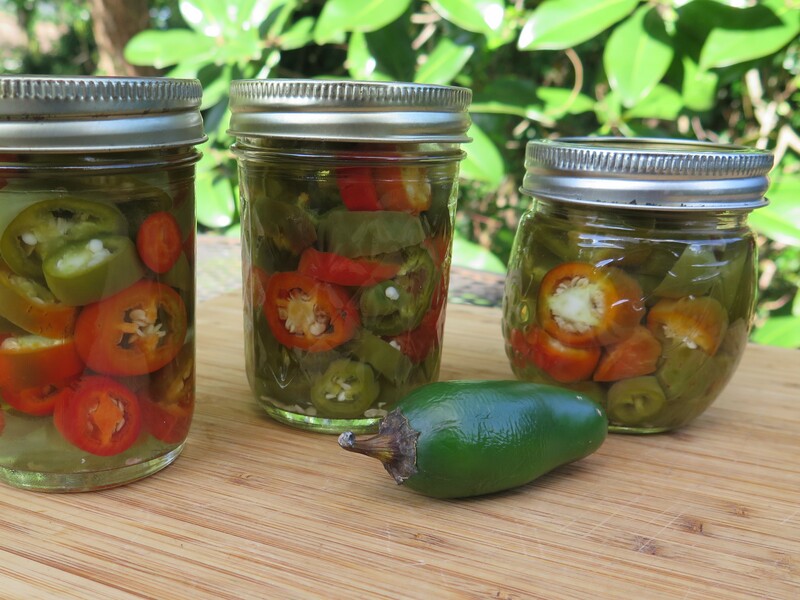 and tagged Home canning, pickled jalapeno peppers by Maylee at Beyond Gumbo. Bookmark the permalink.